July 13, 2018 Vancouver, BC – Yare Media Group Inc. announced today the launch of the 2018 IFAF World Junior Championships international viewing portal. The service includes delivery of all 9 tournament games, including the Gold Medal match, free to registered subscribers. 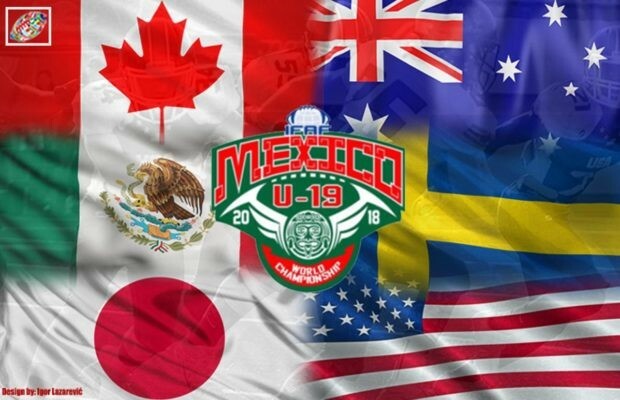 Fans can tune into to enjoy the highest level of U19 football in the world. The games will be delivered live and on demand for delayed viewing. Canada is the defending gold medallist at the event, having defeated the United States at the previous World Junior tournament in Harbin, China in 2016. The broadcasts are presented by Krown Countdown U. English language commentary and overlay graphics are provided by Hubcast Media. Video is provided by Máximo Avance . International Media coverage is provided by American Football International. The service will be available throughout the United States, Latin and South America, Europe, Asia, and Australasia. The service is not available in Mexico and will feature only non-Canadian games in Canada. Within Canada games featuring the Canadian team and the Bronze and Gold Medal games are available through CBC Sports. The portal is offered in a responsively designed interface specifically designed for easy navigation on handsets. The platform also operates on PCs and tablets using HTML5 video technology to deliver HD content in adaptive bitrates, automatically providing users with the optimal resolution for their devices based on their local internet connectivity. International fans (outside of Mexico) with broadband connections can use Chromecast and Airplay technologies to display games on their large screen TVs. The site is at http://ifaf.yaretv.com. With staff in Vancouver, Washington, DC, and Austria, the company helps media properties develop global revenue streams. Yare addresses changing content distribution models in sports, broadcasting and entertainment. The company focuses on helping organizations implement market strategies that generate new over-the-top (OTT) digital revenues and help grow their audience and brand. Yare offers enabling platforms, transcoding, transaction processing, content delivery services, and casting technologies for organizations wanting to deliver high quality video experiences. Clients include: Rogers Sportsnet, the Canadian Football League (CFL), Magnabet, ORF, SAT1, Nintendo, Austria Press Agentur, Canada West University Athletics Association, the United Nations, and Microgaming. The website is at www.yaremedia.com.